Rare midlength Scorp with a bright Orange Julius tint on bottom & rails, clear deck inlay, gloss & polish finish. All Volan butterfly-style fin patch and 3/4 deck patches. Black and white lo-profile logos, black full body pinlines around the deck inlay. Single 3/16" Basswood stringer. Nice 4+1 setup with FCS Fusion boxes; Takayama center fin and side bites all included. 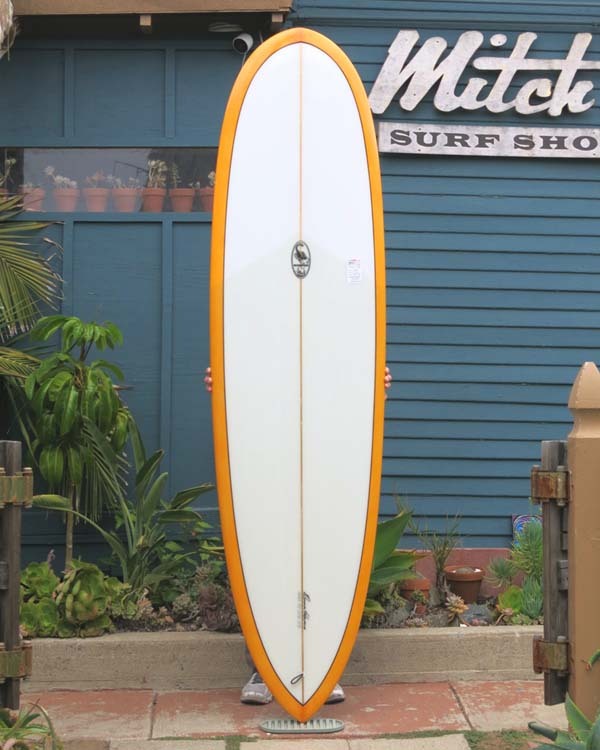 Length: 7' 2" Width: 22 1/8" Thick: 2 7/8"
Nose: 18 7/8" Tail: 14 7/8"
Donald's 1960's design mini-noserider, a fast mid-length board great in turns. Basically a smaller version of the Erik Sommer Model. An excellent alternative for someone looking for a shorter, more maneuverable "longboard".